Col. Marek FAŁDOWSKI, PhD was born in Siedlce in 1971. In 2000, he graduated from the Police Academy in Szczytno. He is also a graduate of the Academy of National Defence in Warsaw (2003) and the Academy of Podlasie in Siedlce, where he received a doctoral degree in philosophy in 2006. In 2011 he graduated from the National Security College and in 2015 – he completed postgraduate studies in criminological pedagogy: prevention of migration crime as part of the Norwegian Financial Mechanism 2009-2014. In 2019, under the resolution of the Council of the National Security Faculty at the War Studies University in Warsaw, he was conferred the postdoctoral degree in the field of social sciences in the discipline of security sciences. He began his career as a police officer in the uniformed branch, and then he continued his work in the Criminal Investigation Branch. In the course of his police service he climbed the career ladder, rising from operational posts to executive positions. Among others, he was the Head of Criminal Investigation Section and the County Deputy Police Chief in Węgrowo, then the Municipal Deputy Police Chief for Criminal Matters in Siedlce. From 17 January 2007 he held the office of the Municipal Police Chief in Siedlce. 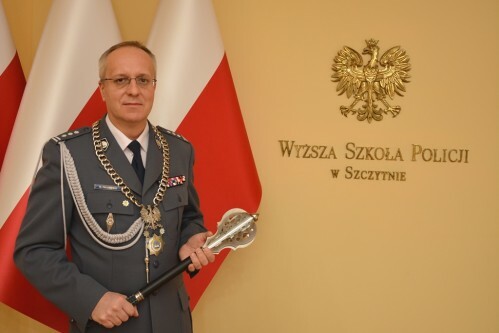 With effect from 11 February 2017, by the decision of the Minister of Internal Affairs and Administration, he was appointed the Commandant-Rector of the Police Academy in Szczytno, more over, since 11 October 2018 as the Commandant-Rector, he also belongs to the group of scientific-educational positions with the title of the professor at the Police Academy in Szczytno. He has long-standing experience in the area of internal security and operation of services subordinate to the minister of internal affairs. He is a member of the Polish Association for Security Science. He is a member of the Polish Association for Security Science, Council for Science and Technology at the National Police Headquarters and Scientific Council of the Police Central Forensic Laboratory.